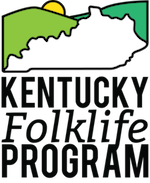 I am happy to share with you that the Kentucky Folklife Program has recently begun work on a new traveling exhibit panel series that will feature the White Oak Basketmaking tradition! Funded by a recently awarded NEA ArtWorks grant, these free-standing retractable panels will incorporate images of basketmakers, their work, and the life narratives of these artists to help contextualize this important local tradition for a wide audience. The panels will begin their journey traveling to six libraries located in the home counties of the artists beginning this summer. To enhance the project and provide an even greater understanding of this important regional tradition we have written additional funding into the grant to bring basketmakers into each library location for hands-on demonstrations and discussion about their work. In addition to documenting and presenting the rich traditions of the state the idea of validating and celebrating the individual creators of this regional art form remains central to our mission. Leona Waddell white oak basket. Photo by Beth Hester and Scott Gilbert. I would be remiss to not mention all the important partners who are helping to make this project take shape. Our new home at WKU gives us the opportunity to work directly with Folk Studies students and our university colleagues. As part of their Museums course led by Michael Ann Williams, the Folk Studies graduate students will begin crafting the initial design layout incorporating appropriate text and images for each themed panel. WKU’s University Publications led by Tom Meacham will be assisting as the project’s final design and printing partner and the Department of Library Technical Services headed by Dean of WKU Libraries Connie Foster has agreed to coordinate and underwrite the shipping of panels from library to library for the duration of the project. University photographer Clinton Lewis and his staff have been enlisted to shoot additional images of baskets and basketmakers as needed. I cannot thank these individuals and partners enough for their gracious assistance. Be looking back for updates on this project as it takes shape. This project is supported in part by an award from the National Endowment for the Arts. Art Works.